Whee! 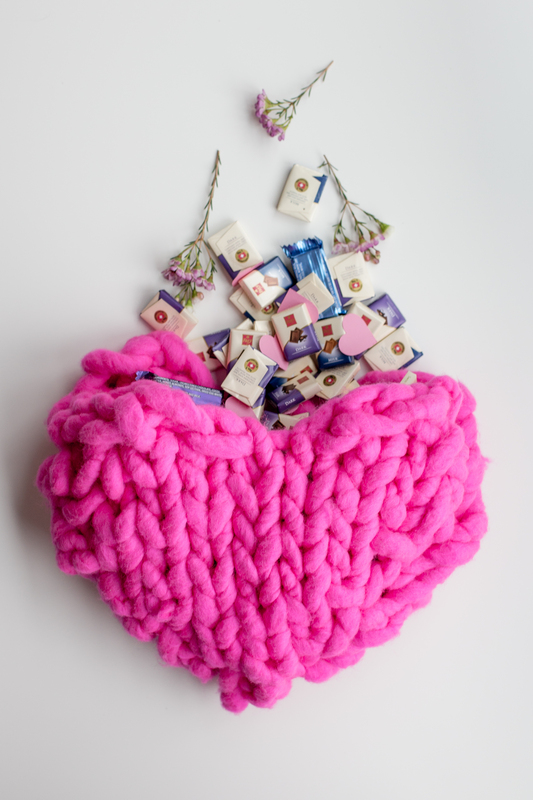 Valentine’s Day is one of my favorite holidays, and what better way to spread your love than this giant knit heart pattern! 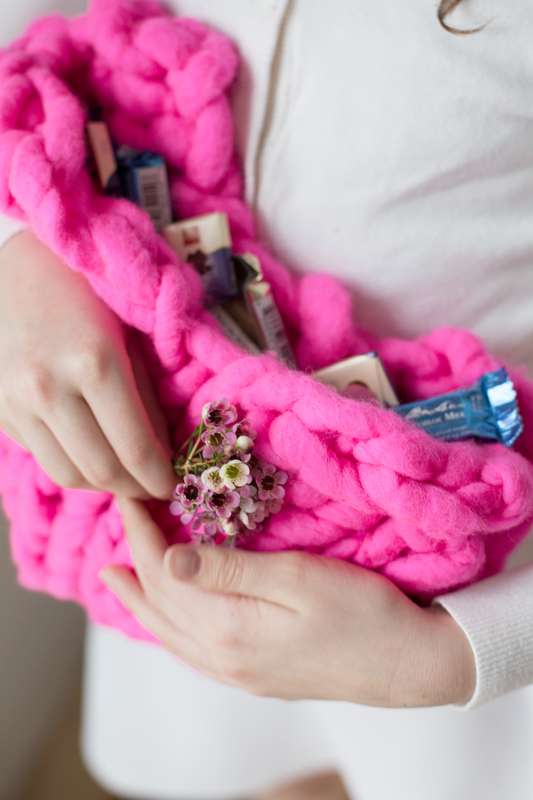 Find the knitting pattern to make this awesome fuzzy pocket of love at the end of this post. Fill the heart with whatever, but I say load it up with chocolate and hearts and balloons and flowers – all the lovely things!! Allie’s heart is filled with Chocolat Frey Napsli Chocolate Miniature bars. Chocolat Frey is Switzerland’s no. 1 chocolate brand and is now available here in the US. These mini- bars are the perfect size to satisfy a chocolate craving without having a huge chocolate bar staring at you from the kitchen counter! You know what I’m talking about. Both the dark and milk chocolate are deliciously perfect bites. I love that Chocolat Frey is GMO-free too. This project is definitely all about small ideas with big heart – literally BIG! After the scrumptious chocolate is gone, Allie plans to use the heart as a pouch to stash her pjs each morning. 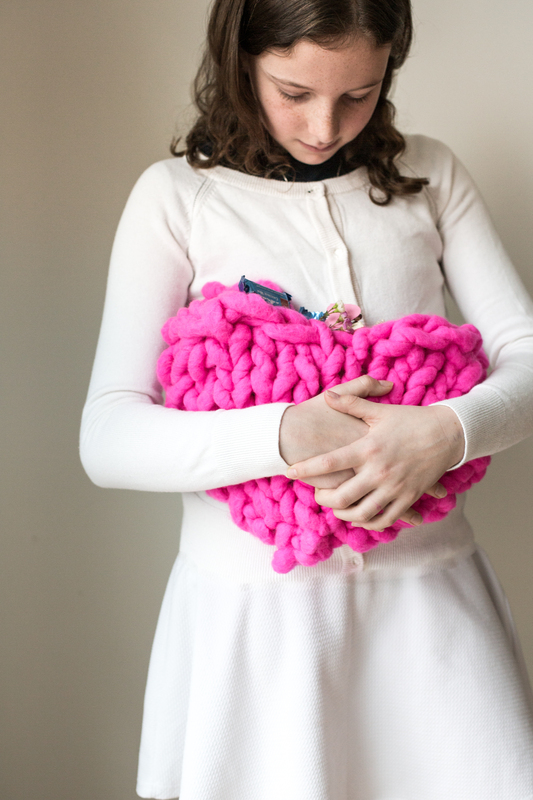 Alternatively , stuff it and sew up the top for an adorable giant knit heart pillow! Or, keep it to reuse every year at Valentine’s Day to fill with something new. Have someone that can’t have chocolate? Very sad, but fill the heart with a pretty bouquet instead! Cast on 1 stitch, leaving a 1 yard tail to seam up one side of the heart. Row 3: Knit row; make 1 stitch at each end of row by working stitch below (5 sts). See photos below for where to make stitch. Row 5: Knit row; make 1 stitch at each end of row (7sts). Row 6: Purl row (7 sts). Row 7: Knit row, m1 at each end of row (9 sts). Now, Row 8: Purl row. Row 11: K2tog, K 2 sts., turn and work these 3 stitches only. (3 sts). Row 13. Bind off. Cut yarn with 8″ tail and bring tail through last loop. Tuck end into back side of heart. Row 11: Rejoin yarn to left side of heart. Slip 1 stitch, Knit 1 stitch and pass slipped stitch over the knit stitch, Knit 1, K2tog (3 sts). Row 12: Purl 1, P2tog (2 sts). Row 13: Bind off. Cut yarn with 1 yard tail. 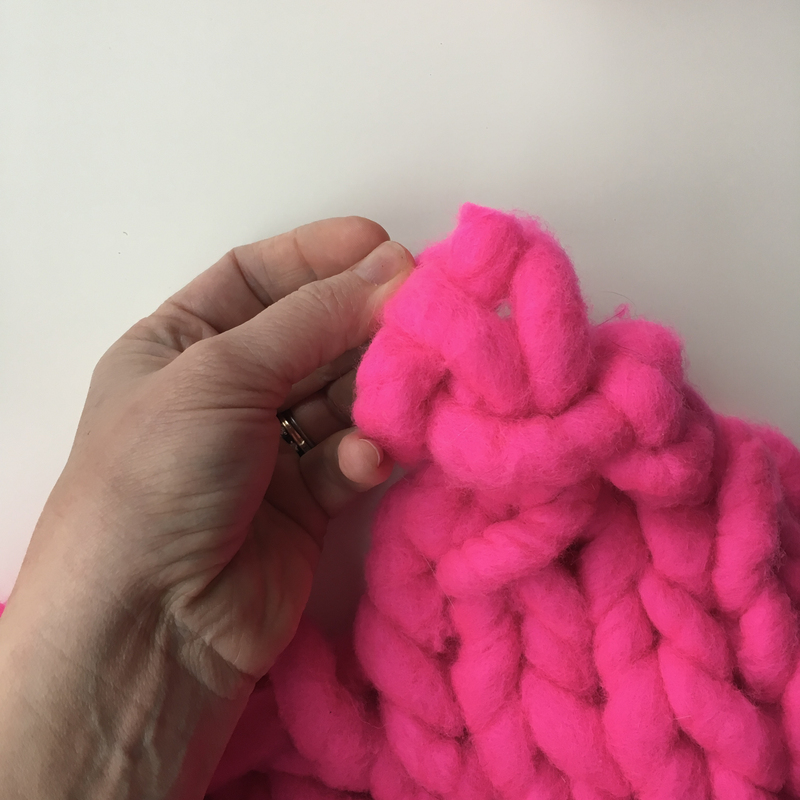 Make another heart with 8″ tails both at the beginning and at bind off. Weave these 8″ ends into back of heart as above photos show. Place the hearts, purl sides facing each other and whip stitch the two together. Seam up the right side with cast on tail. Stop seaming where the heart begins to curve at the top. Seam down the left side with bound off tail. Start seaming at the point equivalent to where you stopped on the right side. Voila! Your giant knit heart pattern is complete! Now, make a bunch of heart confetti. 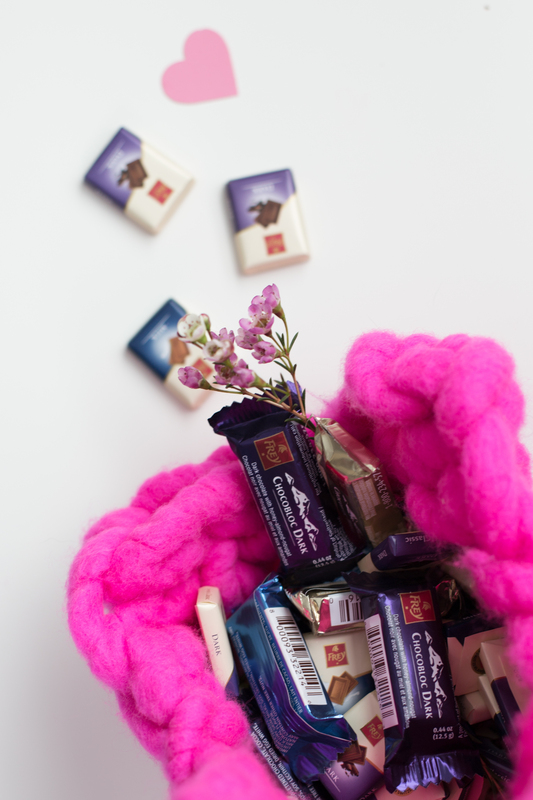 Throw in some flower sprigs, fill with treats, and all our hearts will go pitter patter! 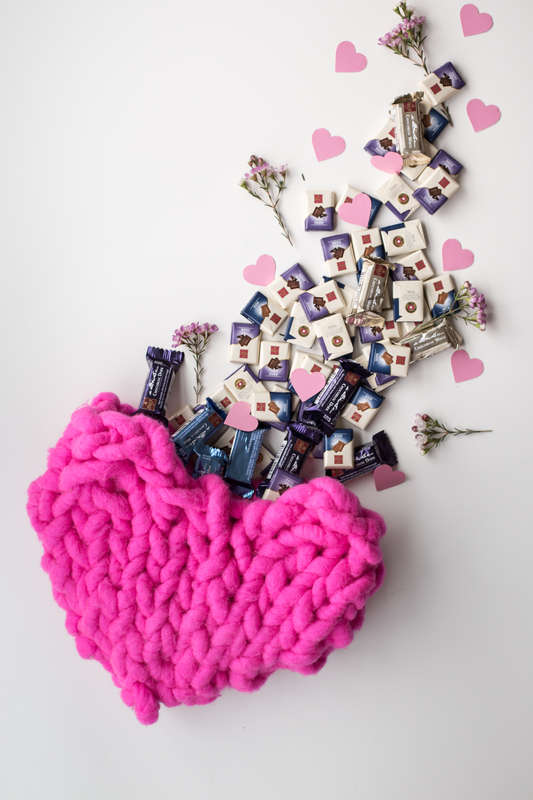 Huge thanks to Martha Stewart and Chocolat Frey which brought this squeezable giant knit heart pattern to you!! It’s just these collaborations that allow Flax & Twine to keep bringing you fun projects and patterns! You can find Chocolat Frey on social channels @ChocolatFreyNA and the chocolate at Sam’s Club, Shop Rite, Shaws, Meijer and more. Where can I get the yarn? Click the link up in the list in materials, and you should go right to the Loopy Mango shop. Hi, I have the pattern to knit the Giant Bunny (arm knitting) but I am having trouble with this technique. Is it possible to knit this with giant needles and if so what size. 15mm? 20mm? 25mm? Thanking you in advance for your reply. Hi Julie! Thanks for writing. One thing to think about if you switch to needles is that you need to reverse every other row’s direction. In arm knitting, you never turn your work around. In traditional knitting you do. Second, even size 50 needles is much smaller than your arms so you would need to cast on more stitches to get the same size. YOu could follow directions for the largest bunny and end up with a bunny closer in size to the smaller version – could be very very cute!